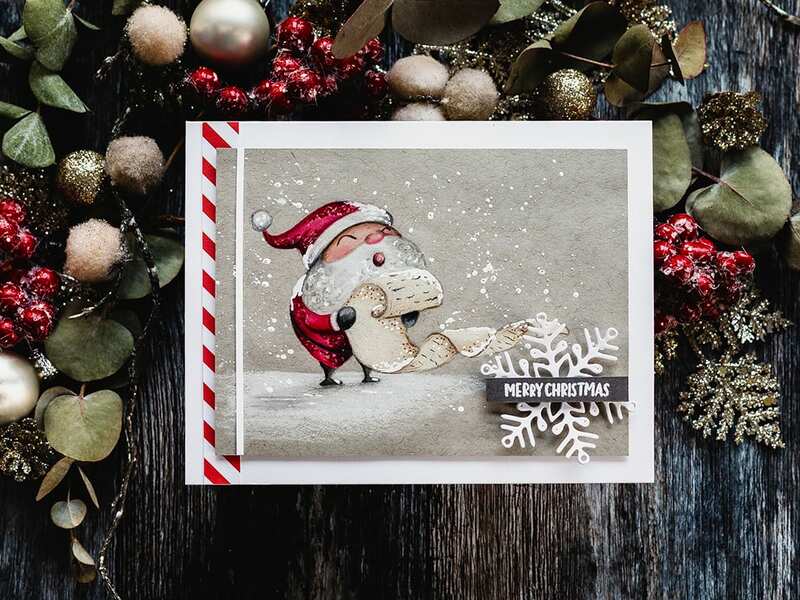 I posted about the latest Simon Says Stamp Card Kit recently, and today I have a card to share using the kit stamp set, Christmas Cheer. As I write this post, there are still some of the December Card Kits available, but you can also purchase the stamp set separately. I’ve linked all supplies at the end of this post. Compensated affiliate links used. 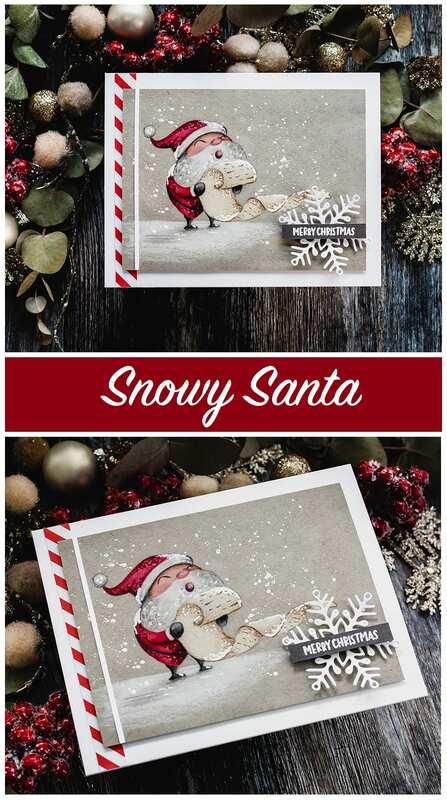 I kept this card quite simple, but tried to get lots of character into that cute Santa image! 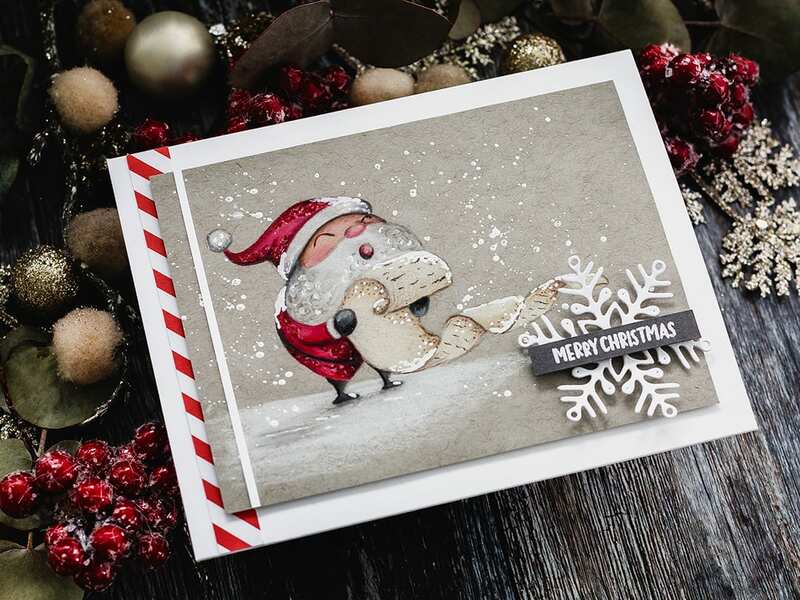 I stamped the Santa from the Christmas Cheer set in clear embossing ink on Toned Gray paper and coloured with pencils. I added white gel pen and glitter gel pen accents to bring the scene to life. I then splattered with white gouache for a snowy look. I stamped one of the coordinating sentiments in clear embossing ink on Slate card and white heat embossed before trimming to a skinny banner. I added the banner with foam adhesive to a white die cut Rina Snowflake and then added the that in turn to the panel. I added a strip of Carta Bella patterned paper to a white card base and then foam mounted the panel on top. Finally, I added a skinny strip of white card to the left side of the panel for balance. You can find links to the supplies I’ve used below; click on the picture or shop icon to get taken directly to the product. Where available I use compensated affiliate links which means if you make a purchase I receive a small commission at no extra cost to you. You can read my affiliate and product disclosure here. I genuinely appreciate your support. Debby this is amazing! I can’t even conceive of doing a scene so incredible but I have to say the only thing better than this would be to see you do it on video. This is absolutely INCREDIBLE! Your coloring is way over the top, Debby. That Santa looks real enough to jump off the page. Love the snow and black added to his red suit. Awesome. What a great scene! Your coloring and details are fantastic! Your card is stunning. I have to have that stamp now! This is so stunning. I can’t wait to get my kit, that Santa is so cute and unique. I wish you had done a video. I love watching your cards come to life. 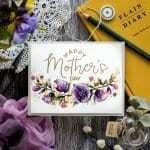 This is very stunning card! When I received my kit. I was in love with how big the stamp set was!! I just hope I can make something so beautiful. Thank you for sharing this with us. I do love those big stamp sets that come in the kit! By far my favorite card made with this stamp! Awesome job!